The very best for blondes from Klorane, John Frieda and L'Oréal! 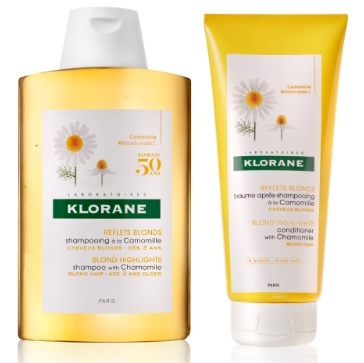 Klorane Shampoo with Chamomile - 200ml - $10.60 - naturally illuminates blonde to light-brown hair with a clean and light formula that doesn't weigh hair down and is gentle enough to be used on children. Along with an enhanced floral honey scent. Klorane Conditioner with Chamomile - 200ml - $12.60 - with a cream texture that melts into the hair and brings out the hair's blonde highlights and shine while detangling, repairing and softening. Available next month in drugstores across Canada. John Frieda Sheer Blonde Go Blonder In-Shower Lightening Treatment - 34ml - $12.99 - helps all shades of natural, colour-treated or hightlighted blonde hair go one shade lighter in one wash while instantly softening dark roots and lights blonde tones for natural, shimmering colour that instantly lightens your look.